This classic work is an exploration and celebration of man's relationship with food from earliest times to the present day. 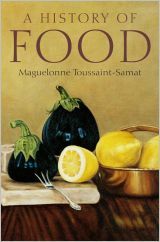 Maguelonne Toussaint-Samat tells the story of cuisine and the social history of food taking in fascinating, little-known byways along the journey. For instance, we learn that Aztecs enjoyed chocolate as a drink with chilli and honey; we discover the Iroquois origins of popcorn; we hear about the potential culinary and farming uses of lupin seeds. Toussaint-Samat looks at the transition from a vegetable- to an increasingly meat-based diet, as well as at the relationship between people and what they eat, between particular foods and social behaviour, and between dietary habits and methods of cooking. This new expanded edition includes a foreword by food writer, Betty Fussell, author of The Story of Corn and Raising Steaks, a new final chapter covering recent developments in food production and consumption around the world, and an updated bibliography. Beautifully illustrated with nearly 70 figures and new color plates, A History of Food will continue to be read and enjoyed by a fresh generation of readers. Foreword to new edition by Betty Fussell. Part I: Collecting, Gathering, Hunting. 2. The history of gathering. Part II: Stock-breeding, Arable Farming: Meat, Milk, Cereals. 4. The history of meat. 5. The history of dairy produce. 6. The history of cereals. Part III: The Three Sacramental Foods: Oil, Bread, Wine. 7. The history of oil. 8. The history of bread and cakes. 9. The history of wine. Part IV: The Economy of the Markets. 10. The history of fish. 11. The history of poultry. 12. Treasures from the sea. 13. The treasure of the forests. Part VI: The Era of the Merchants. 15. Spice at any price. Part VII: New Needs: Sugar, Chocolate, Coffee, Tea. 16. The lure of sugar. Part VIII: Orchards and Kitchen Gardens. 21. The tradition of fruits. 22. The evolution of vegetables. 26. The assurance of dietetics.